I have been on the hunt for the perfect mustard yellow top (similar) and I was finally successful at none other than the thrift store! Plus, it was only $1.50 so I was pretty happy to say the least. It is an XL, so obviously it is a bit baggy on me, but that is exactly what I wanted. I love the relaxed, casual look oversized tops have. I paired this yellow top with my yellow tinted sunglasses (naturally). Pulled on my favorite high-waisted jeans and these dark green boots to complete the look. And can we just talk about Drake’s new More Life album for a quick sec? I am really digging the vibes of it and have had it on loop since it came out Saturday night. Some of my favorite tracks: “Passionfruit”, “Get It Together”, and “Ice Melts” just to name a few. A lot of amazing feel-good, summer songs. What are your thoughts? LOVE this color on you! Mustard is such a fun color to style! This color looks so great on you! I love the cut of it – the perfect casual piece! 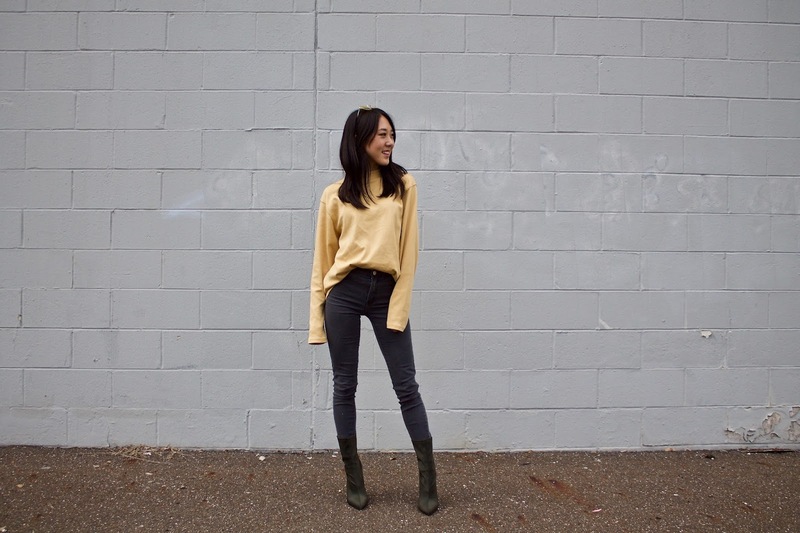 Love how you styled the mustard top with the forrest green boots! Love this whole look and those boots are perfection! love that colour, the top is really cute and I can't believe it was only $1.50! I love mustard, I really don't know why I have always though about it as a wintery color rather than one for spring. I'll try and see how that couple of mustard pieces I own work in spring! Super cute!! Love that colour on you. Love you styled this thrift store find! Those boots are amazing! What a steal!! The color is perfect for you. this color looks so good on you! It's usually really hard to pull off a color like that but it worked for you! I love the color of that mustard sweater. I've been meaning to add some more yellow to my wardrobe! That is one of my favorite colors! Ah! Love love love! Love this look, the tinted yellow shades are so cute!! What a great find! I love it with the color of your denim and boots. Love it, such a pretty color! Omg I can't believe that top was $1! And I love the booties hehe! Honestly, I love the top, but i'm obsessed with your booties!!! Love the color and the length! NEED! You look amazing! I love that colour. Dude, $1.50 is AMAZING. I wish UK had more thrift stores that are actually affordable, ugh. All these 'vintage' stores are just way too overpriced. Love the colour on yoU! Girl, what a score on that shirt! I love the way you've tucked it in and paired it with the grey jeans, as well as the addition of the yellow sunnies; such great styling! Thanks so much for sharing, beauty, and I hope you're having a great day so far! I love this color on you and the sunglasses were the perfect addition! This mustard yellow looks perfect on you, Keri. Love your top, looks amazing on you! I can't believe the price! Looks so comfy and cute, awesome styling ! Oh! I love this top! Such a gorgeous color, and it look really good on you! Simple yet appealing! Love this look! I am obsessed with this look, girl. 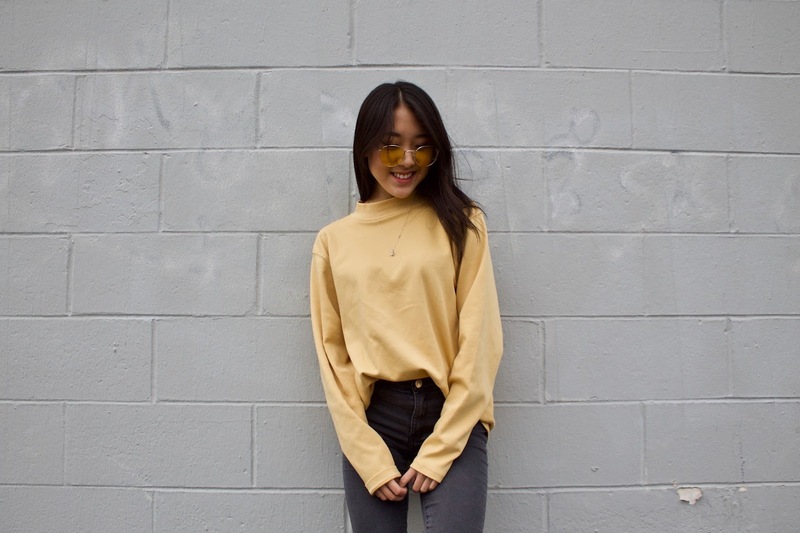 I have been gravitating towards oversized pieces lately, so just fell in love with that yellow sweater, a real steal!! I’m curious to discover which website platform you have been working with? I am experiencing some minor safety difficulties with my most recent blog regarding medical lawsuit and I’d like to find something more safe. Do you have any solutions? It was great to read this and I believe you’re absolutely right. Tell me if you are looking into omega xl supplement, that’s my principal expertise. I’m hoping to see you in the near future, bye for now! Hey there, you’re certainly correct. I frequently go through your content thoroughly. I’m also focused on upvc french doors, maybe you could discuss that occasionally. Take care. Many thanks for this awesome content! I definitely enjoyed it.I will be sure to save your website and definitely will come back in the future. 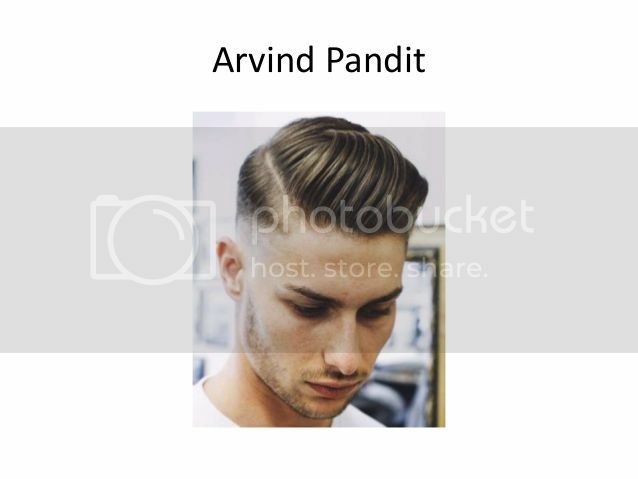 I would like to encourage that you continue your nice posts, even discuss Arvind Pandit Kansas too, have a superb afternoon! You’re entirely right! I enjoyed reading through this and I will certainly come back for more straight away. My site is about intercom system installation, you might have a look if you’re still interested in that. You’re entirely correct. I loved reading through this article and I will certainly return for more right away. My own internet site is on more followers on instagram, you might take a glance if you happen to be interested in that.